Reliance Industries Chairman Mukesh Ambani at the company’s 40th annual general meeting announced the much-anticipated JioPhone which will be available for trials to select customers starting August 15. The JioPhone will be going up for pre-orders starting August 24 and it will delivered on first-come-first-serve basis from September. Interested customers can pre-book a JioPhone via the MyJio app or by visiting a Jio retailer from August 24. 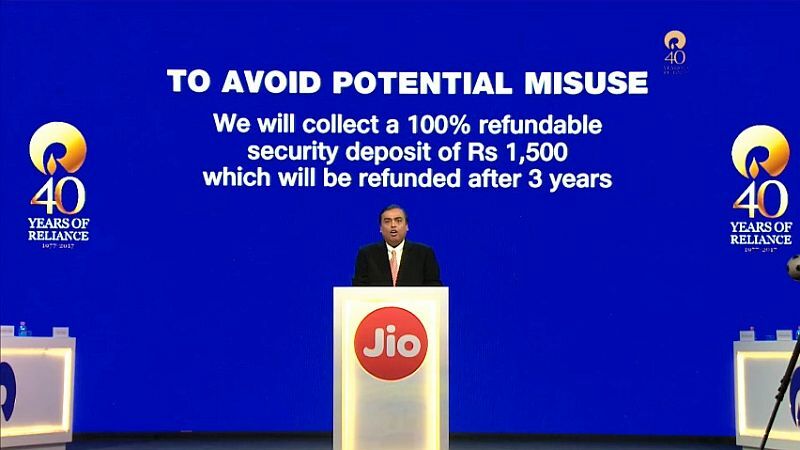 Mukesh Ambani has announced ab ‘effective zero price’ offer for the JioPhone under which interested users will have to pay a refundable security deposit of Rs. 1,500, which can be refunded after 3 years. Ambani during the 40th AGM stressed that the JioPhone will be available to customers at an effective price of Rs. 0, considering that they can collect the entire security deposit after 36 months. “The security deposit is necessary to avoid any potential misuse of data,” said Ambani. We can expect more details to follow soon. Ambani confirmed that there will be 5 million JioPhone units that will be available every week for customers in India. To recap on the JioPhone, the entry-level phone will come with unlimited voice, data, and texts. The JioPhone customers will have to recharge with a Jio Dhan Dhana Dhan monthly pack of Rs. 153, which will give them free voice, texts, unlimited data, and free access to Jio apps. At the 40th AGM, Ambani also announced an accessory “Jio Phone TV-Cable” that will allow users to connect their phones with any kind of television sets. For connecting phone to TV, users will have to recharge with Rs. 309 per month pack for large screen. Talking about features of JioPhone, the phone supports 22 languages and can be controlled via voice command. A short demo of the voice command feature on JioPhone was showcased during the keynote presentation where the device was able to play music via Jio Music. Additionally, the JioPhone will also come with a panic button that is enabled when long-pressing the number 5. Moreover, the JioPhone will come with advanced NFC support that will be rolled out to users via OTA software upgrade.